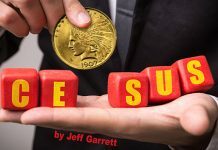 A Weekly CoinWeek Column by Greg Reynolds ……. Before 2005, just seven 1817/4 overdate bust halves were known and four have curiously appeared since, bringing the total to eleven. The second or third finest is currently ‘in the news.’ The Meyer-Pogue 1817/4 will be auctioned by Stack’s-Bowers on Sept. 30, at Sotheby’s headquarters in New York city. as part of the Pogue II sale. Herein, a tentative condition ranking for this famous rarity is put forth. 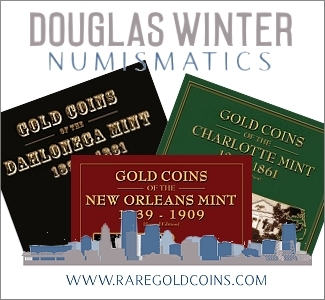 Around the same number of 1838 New Orleans Mint halves survive, between nine and twelve, possibly just nine. The 1838-O, however, is not a business strike and is of a different design type. The Eliasberg-Gardner 1838-O was auctioned in May 2015. 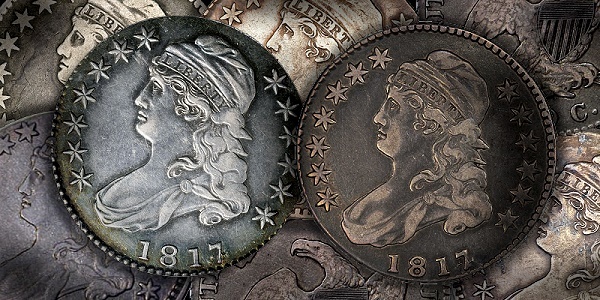 All U.S. silver coins were struck at the Philadelphia Mint until production began at the New Orleans (‘O’) Branch Mint in 1838. 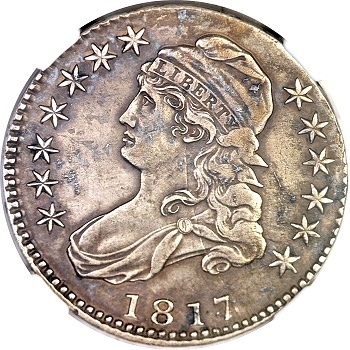 The 1817/4 is, by far, the rarest half dollar of the Philadelphia Mint, and no uncirculated 1817/4 bust halves are known. Interested collectors feel fortunate to just see one, in any grade. The Meyer-Pogue 1817/4 is mentioned ahead of the condition ranking as it is ‘in the news.’ It is PCGS graded Very Fine-35. The only one graded higher by PCGS is the finest known Eliasberg coin, which is currently PCGS graded as AU-53. 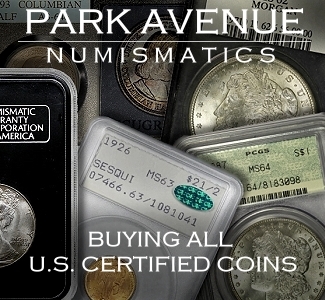 It was PCGS graded as AU-50 for many years. The Meyer-Pogue 1817/4 is a neat coin. The wear is honest and normal. The inner fields toned a brown-russet color and the russet outer fields are green tinted. The highpoints are of a tan hue and contrast well with the deeper toned fields. There are blue-green patches here and there, which naturally layered with the dominating brown-russet tone. Miss Liberty’s hair is blurred and grainy as struck, which is typical for 1817/4 halves. The overdate feature is not as bold as it is on some others, though is clear. This coin was moderately cleaned in the past and there are hairlines everywhere. These are not particularly bothersome and are largely covered by natural toning, which seems to be very stable. Most collectors of half dollars ‘by date’ would very much like this coin. Even if it was not a rare date, it would still be likable. As to whether it is the second or third finest known, I am not sure. I have never seen the Floyd Farley 1817/4 and opinions of experts vary. I have seen six of the eleven 1817/4 halves. They tend to be somewhat more attractive in actuality than they appear to be in published images. They also have colors that do not seem to be captured by cameras or scanners, especially green-blue tints. It is also true that the extent of past cleanings is often understated in images. 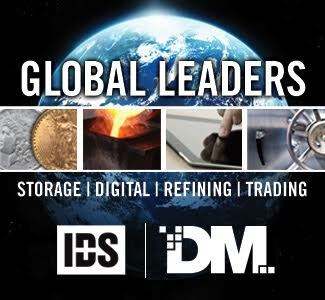 I have discussed all of them with Sheridan Downey, the leading specialist in Capped Bust halves, and with Charles Link, the leading collector of Capped Bust halves. Link has studied the series for decades and has examined ten of the eleven known 1817/4 halves. Downey has also seen ten of the eleven. Input regarding particular pieces has come from Richard Burdick, Andy Lustig and John Albanese. The following condition ranking is very tentative and will probably be revised. I thank Sheridan Downey for granting permission for his roster to be employed as a basis here, though my rankings and grades are a little different from his. E. T. Wallis is credited with discovering the 1817/4 overdate, which was verified by M. L. Beistle and Howard Newcomb. Beistle and Newcomb were widely recognized, die variety specialists during the first third of the twentieth century. 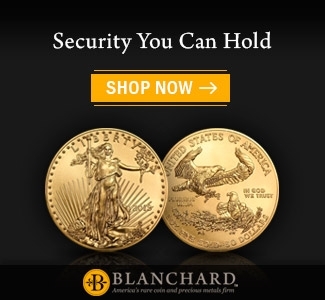 According to Sheridan Downey, the Eliasberg coin was “offered in a Fixed Price List by E. T. Wallis” in 1930 and was “said by Wallis to have been in a family collection since 1846.” During the early 1950s, Al Overton re-discovered it when it was in a private collection and supposedly mis-attributed by the owner. Overton sold the Wallis 1817/4 to Louis Eliasberg, Sr.
Indisputably, the Eliasberg piece has the most detail of all surviving 1817/4 halves. 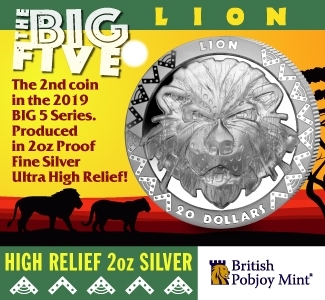 Charles Link, who has owned this coin since 2009, acknowledges that “the Dosier piece is superior in terms of originality.” Nonetheless, the Eliasberg piece is clearly gradable and is attractive overall. The moderate to heavy cleaning is extensive and some liquids were used that were harmful to a minor extent. 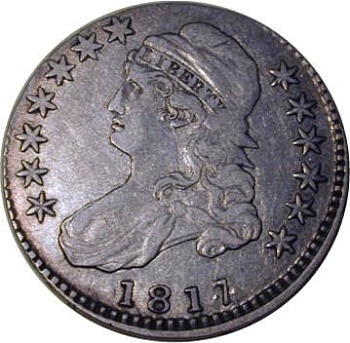 The many hairlines are not much different from the hairlines found on most early 19th century coins. The Eliasberg 1817/4 naturally retoned with pleasing colors about the outer fields and periphery. This coin was graded by a cataloguer for Bowers & Merena, probably either Mark Borckardt or QDB, as EF-45 before it was auctioned as part of the Eliasberg ’97 event, for $209,000. My notes, which are only partly legible, indicate that bidder #392 was successful at the Eliasberg ’97 event in New York. 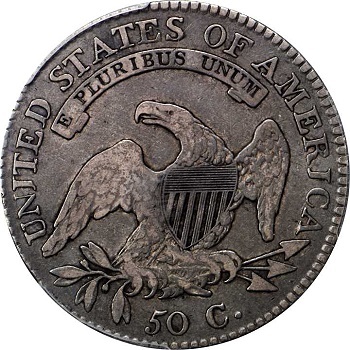 “Don [Kagin] and I bought the coin out of Eliasberg, slabbed it [AU-50 by PCGS], and sold it almost immediately, through an intermediary, to Suros. I don’t remember exactly what we got for it, but I do believe it was significantly more than $250,000,” Andy Lustig states in response to my questions. Dr. Juan Suros was a widely recognized collector of the era. He is a surgeon who was then practicing in Southern California. In February 1999, Superior Galleries auctioned Suros’ collection of overdates, which included an 1825/4 half eagle to which I recently referred in the context of 1825/1 or “1825/4/1” half eagles. 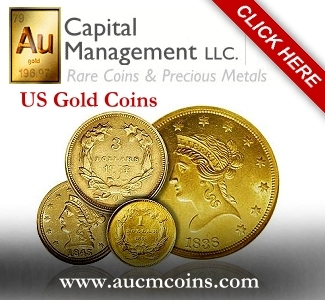 There is some controversy as to whether this coin really sold in 1999 for the reported price of $184,000. If it sold, Don Kagin and Jay Parrino bought it at the sale or not long afterwards. 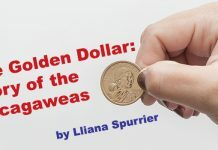 This coin did not sell when it was offered in the 2003 ANA sale by Bowers & Merena (Louisiana) in Baltimore. It seems that either Dr. Suros bought this coin again before 2004 or he owned it from 1997 to 2004. For Suros, this same coin served two purposes during his collecting odyssey. When Suros collected overdates during the 1990s, he desired the Eliasberg 1817/4 as a famous overdate. After Suros decided to collect Capped Bust halves ‘by date,’ Suros needed an 1817/4 for his set. His “Coronado Collection” of Capped Bust halves was consigned to the firm of David Lawrence. Confusingly, this set was included in an auction of silver coins from the Richmond Collection. Some of my colleagues in the coin community have been under the impression that this 1817/4 was part of the Richmond Collection. As far as I know, however, the collector known as Richmond, who lived in the Midwest, never owned an 1817/4 half dollar. Juan Suros, MD was the consignor in 2004. 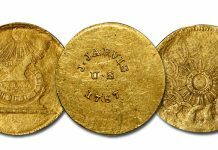 The Eliasberg-Suros 1817/4 brought $333,500 on Nov 29, 2004, as I reported in Numismatic News newspaper. This was then an auction record for a Reich “Lettered Edge” half. At the moment, I do not remember if an 1838-O half had sold for more than $333,500 before November 2004. 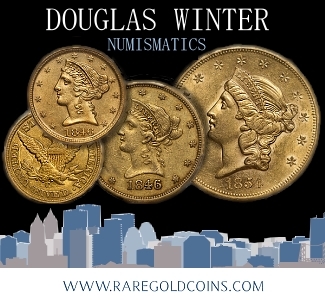 The Rogers-Foxfire-Pogue 1797 half set a record when it realized $517,000 in the Stack’s session of Numisma ’95, which was conducted late in November 1995. That same coin went for $1,527,500 on May 19, 2015. The finest known, Garrett 1853-O ‘No Arrows’ half reportedly sold for “$310,500” in the Spectrum-B&M auction of July 2004 in Baltimore. I was informed by Jay Parrino that he was the consignor. Buddy Byers successfully bid on the Eliasberg 1817/4 half ‘in person’ on Nov. 29, 2004. He was ecstatic about his purchase, which certainly resulted in a very much complete set of classic U.S. half dollars After Byers won this coin, he asked that I join him for dinner. I declined because I wished to return to the auction and then write my articles. On October 17, 2006, when Stack’s (NY) auctioned Byers’ collection of half dollars, the Eliasberg 1817/4 brought $310,500. An influential collector/dealer was the successful bidder. He prefers that his name not be published. Thus same coin then appeared in the Stack’s pre-ANA sale of July 2009 in Los Angeles, at which time it brought $356,500. Charles Link has publicly identified himself as the buyer. This coin was later upgraded by PCGS to “AU-53.” Sheridan Downey grades it as “EF-40, lightly cleaned.” Perhaps EF-45 is the best grade. The AU-50 grade was widely accepted and an AU-53 grade is defensible, maybe. Much of Miss Liberty’s hair tends to be very weakly struck on 1817/4 halves and may give some collectors the impression that these have more wear than actually occurred. Sharpness of AU-50 or higher by current standards, EF-45 net, may be the clearest grade for the Eliasberg-Suros-Link 1817/4. The physical characteristics of this coin have already been discussed and it is certainly pleasing. The history of the Meyer-Pogue 1817/4 is fairly well known. Sheridan Downey related that it was “located in Oakland, CA by Al Overton in 1962 and sold to Empire Coin Co.,” which was operated by James Ruddy and Q. David Bowers. They may have sold it to Hazen Hinman. The Hinman collection was auctioned by Paramount in 1965, though the Hinman name was probably not then announced. QDB wrote the catalogue. From 1973 to 1975, Bowers & Ruddy offered this coin. It was purchased by Gloria Meyer for her husband, Charlton Meyer. In 2008, it was acquired by the Pogues. In a catalogue published in July 2005, in which Downey offered the Burke 1817/4, the Meyer 1817/4 is referred to as the “second finest known,” though Sheridan did not seem certain about this point in recent communications. He sometimes refers to “a tie between the Farley and Meyer coins.” Evidently, the Floyd Farley 1817/4 is very similar to the Meyer-Pogue piece. I have not seen the Farley 1817/4. Downey reports that “Stewart P. Witham acquired the coin on behalf of Floyd Farley from researcher Donald Taxay in 1968. Farley consigned the coin for sale at the July 2002 ANA Convention. It sold to an advanced collector who prefers anonymity for $132,000. He had NGC grade it. He collects by die variety and I believe that he still has it,” Sheridan adds. 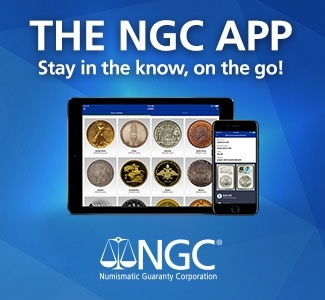 It seems that this coin is NGC graded as VF-25, though I have come across reports that NGC assigned it a different grade. In some cases, there are typos in published reports and discussions. Another possibility is that the it may have been upgraded at some point between 2002 and 2015. In the auction catalogue for the Platinum Night event of July 30, 2008, a Heritage cataloguer remarked that the Farley 1817/4 half is “considered finer today” than VF-25 “by most experts.” Maybe PCGS or NGC would grade it as VF-30 or -35 in 2015, if it has not been upgraded already? “Stewart Witham purchased the piece [on] May 18, 1966 from Ed Johnson, an Ohio dealer, who had owned it since the 1940s. Witham sold his collection privately in 1983,” Downey stated in 2005. 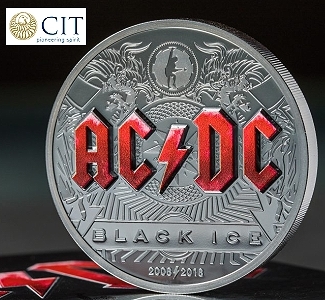 Although this is a decent coin, with attractive natural retoning, it has some noticeable technical issues and does not receive a very high score in the category of originality. Although Downey remarks that the “Witham piece is a sketchy, cleaned VF,” he does regard it as the fourth finest known. This coin has been moderately to heavily cleaned, and there are quite a few scratches, along with a number of contact marks. Although no one expects a VF-20 grade coin from 1817 to be perfect, a net grade of Fine-15 could be fairly figured. 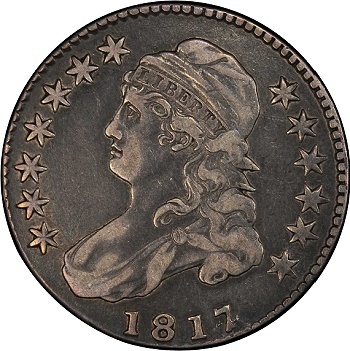 The Witham 1817/4 half has “more meat” and “also more hairlines” than the Burke coin, Downey asserts, though Sheridan firmly determines that the Witham coin is of higher quality overall than the Burke 1817/4. Downey grades the Burke coin as Fine-15. NGC graded it as VF-20 long ago. Sources suggest that, after repeated attempts at crossovers, PCGS finally crossed it at the VF-20 level in 2009. I have never seen this coin. Although Alfred Burke bought this coin in 1965, he did not then know that it was an 1817/4. In the early 1970s, Burke was not able to match the obverse of this coin to a variety listed in the standard reference by Al Overton. Sheridan Downey has indicated that “Burke’s wife, Marion, came to the rescue.” She noted that the 1817 ‘punctuated date’ and the 1817/4 share the same reverse die and she figured out that her husband had an 1817/4. This is the sixth to be discovered. 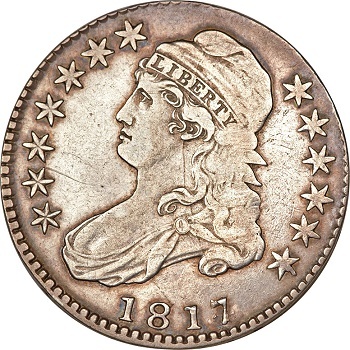 It seems that Burke owned the coin from 1965 to 1997, so it is more than fair that this 1817/4 half is named after him. In a single lot sale on April 1, 1997, Downey sold the Burke 1817/4 to Donald Parsley, Al Overton’s ‘son in law,’ for $135,000. I rely on Downey here as Sheridan is the only expert I know who has a clear recollection of the Burke 1817/4. “The fields are medium to dark grey, the devices lighter. The surfaces are completely free of distractions,” Sheridan states. 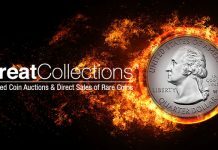 Downey grades the Dosier coin as Fine-12 and it was PCGS graded as Fine-15 in 2004. I saw this coin in 2004, soon after it was PCGS graded. I found the PCGS grade to be fair. Of the six that I have examined, this is the one 1817/4 that jumped out of the holder and grabbed me. The wear is honest and even. There are minimal marks. A past cleaning was so light that it is barely worth mentioning. The natural toning is exceptionally appealing, with much green color. The Dosier-Link 1817/4 is an excellent coin. Although Downey notes that the Burke coin has more detail, he speaks of the “lovely originality” of the Dosier coin. Elton Dosier purchased this coin from Downey in 1988. Around ten years later, John Crowley bought it out of one of Downey’s “mail bid sales” for $90,860. Crowley, in turn, consigned it to a later Downey “mail bid sale.” In August 2001, Jonathan Tidwell acquired it for $116,771. In June 2004, a New York wholesaler bought it from Downey and that New York dealer, in turn, sold it to Charles Link for $155,000 during December 2004. “Yes I own both the Eliasberg and Dosier coins,” Charles Link confirms, in response to my inquiry. 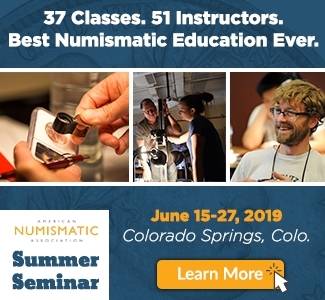 As for why Link owns two 1817/4 halves, Chuck explains that “it appears as a reasonably likely scenario that the drastic bisecting crack on the 1817/4 resulted in an early due failure of the die. So, since I was always very interested in rare die marriages, overdates and dramatic die states of Capped Half Dollars, it was hard not to be intrigued by the two clear die states that exist in 1817/4. The Dosier-Link PCGS F-15 specimen has no hint of the die crack that is bold on the Meyer-Pogue coin,” Link emphasizes. Chuck is thus keeping representatives of two die states of 1817/4 halves. Reportedly, the Louisiana 1817/4 was discovered in 2012. 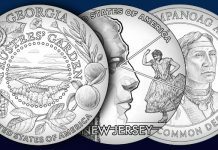 Downey refers to it as “lovely.” PCGS graded it as VG-08. I have not seen this coin. The Louisiana 1817/4 is in more than one PCGS registry set under a non-distinctive name, ‘EarlyHalves.’ Of the four 1817/4 halves that have emerged since the Eliasberg-Suros coin sold for $333,500 on Nov. 29, 2004, this seems to be the only one that is indisputably gradable. 8. Corroded – “Extremely Fine” details – Net Good-06? This piece was discovered in 2005, reportedly in dirt in upstate New York, and was ANACS authenticated with the notation that it has the details of an Extremely Fine grade coin. Years later, it received a similar certification from NGC. This coin was auctioned three times by Heritage, in January 2006 for $253,000, in April 2009 for $109,250 and in August 2012 for $164,500. I saw it in 2012. It has severe problems. 9. Merrill VG+ Details – Net AG-03? This coin has very noticeable gashes on the obverse, especially a long wide cut. Before being PCGS graded as ‘Good-06,’ it was ICG graded as “VG-08” with a qualifying note on the holder that there is an ‘obverse scratch.’ There is not such a qualifier on the PCGS holder. Perhaps it was ‘net graded’ by PCGS, as it does seem to have the details of a VG-08 or higher grade coin. It has other problems in addition to the two readily apparent gashes on the obverse. 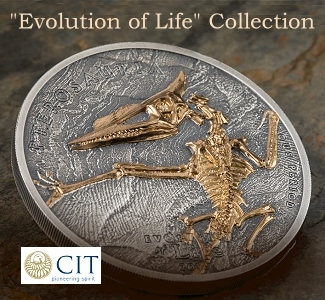 It is now in the “Merrill Collection” in the PCGS set registry. 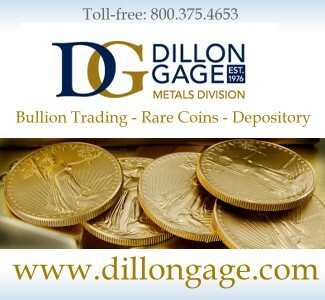 On July 30, 2008, when markets for rare U.S. coins were literally peaking, this coin brought $87,499.99. If relevant bidders were convinced that this piece merited a grade of VG-08 or even of Good-06, it would have than sold for more than $135,000, perhaps much more. 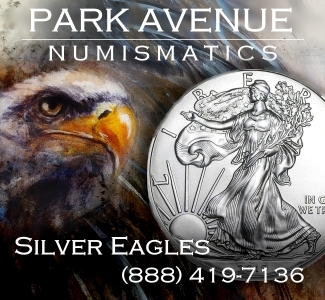 Many auction records were set that night, including a price of $632,500 for an NGC graded AU-58 1804 dime! 10. Tooled — VF Details? – Net Fair-02? A PCGS authenticated 1817/4 appeared in a Stack’s-Bowers auction in August 2014. I saw it. It is said to have the details of a Very Fine grade coin. Metal has been moved considerably and other work has been done on this piece. It did not sell in this ANA auction. The story behind its emergence is not clear. In any event, it is unsettling. Completing sets is fun and satisfying, though, so I expect that there are many collectors who would like this coin. 11. Cobb — Repaired, Good-06 Details – Net Poor-01? 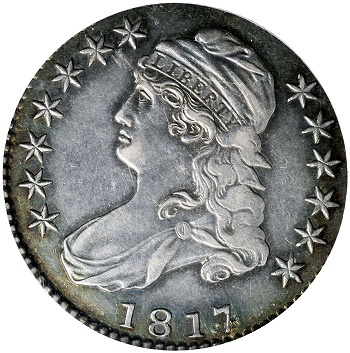 Downey refers to the Cobb coin as the “worst” known 1817/4 half dollar. I have yet to hear anyone remark about it in a positive way. I have never seen it. I might like it more than I would expect to like it. Sheridan Downey strongly believes that the four new discoveries are all genuine. He adds that “it is very likely that more 1817/4 halves will be discovered in the future.” I am not convinced of either point. The underlying four is rather apparent on 1817/4 halves and the premiums attached to this overdate have now been widely reported via the Internet. 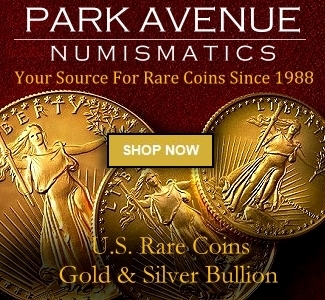 Are there many ‘1817’ halves that have not been re-evaluated? From 1976 to 2004, there were no new discoveries of 1817/4 halves. 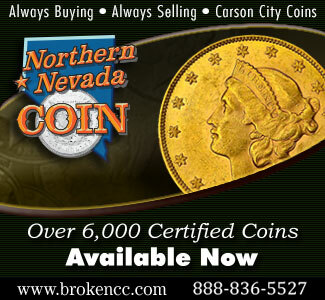 On Nov. 29, 2004, the Eliasberg coin sold for $333,500. In the minds of people who make forgeries, this would probably be a rather hefty amount for an obviously circulated silver coin. The other half dollars that are worth more tend to grade above AU-55. People who craft forgeries might have then logically figured that a deliberately worn and harmed, fake 1817/4 could be sold for at least $50,000. 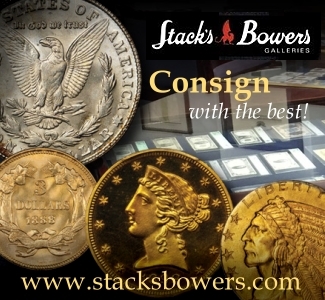 Even a net profit of $20,000 might be significant for some forgers. In earlier eras, fake rarities of this nature tended to be accidentally or deliberately mis-attributed die varieties or to be die-struck forgeries with clearly incorrect die characteristics, relating to the placement of numerals, stars, branches, or serifs on letters, among other design elements. With technology developed in the late 20th century, however, there is no longer a need to hand-engrave dies, punches or hubs. An image on a computer screen can be impressed into a die without much human involvement. To a large extent, the die markers on a forgery made with such equipment may be the same as the die markers on a genuine piece. Of course, die-struck forgeries are different from genuine pieces in many ways. In order to reduce the number and magnitude of detectable differences, the forgers may artificially wear or deliberately harm their products; there would thus be less ‘information’ available to be used for authentication. 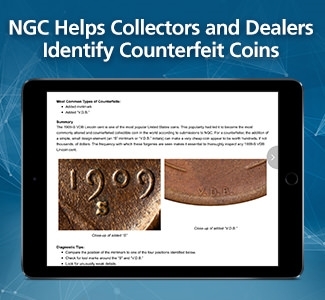 Heavily worn and/or non-gradable “coins” are harder to authenticate than high quality pieces. 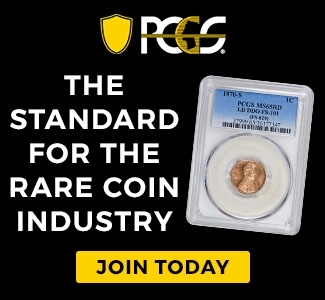 I am curious as to the methods employed by the experts at PCGS and NGC to authenticate the four 1817/4 halves that appeared since 2004. Supposing, hypothetically, that a forger used a computer and die making equipment that was developed in the late 20th century. 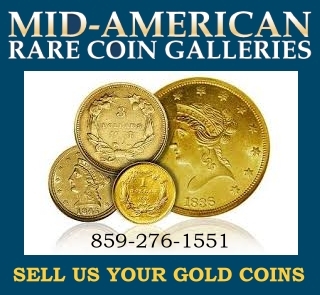 Most such equipment was probably geared towards producing the low-relief coins and tokens, with bland and simple design elements, that contemporary mints tended to manufacture during the last quarter of the 20th century. One of the most difficult features for the forgers to reproduce might be the numerals of an overdate, as the effects of overpunching in the 19th century might not be effectively mimicked with automated die-engraving equipment. Therefore, hypothetically, if the numerals of the overdates seem fake on a fake, the forger may scrape the area around the numerals and elsewhere on the obverse to deflect attention from not so deceptive aspects of his creation. In any event, it might very well be true that all four new discoveries are certainly genuine, and I am not suggesting otherwise. 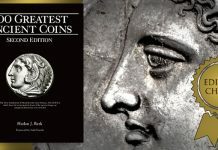 I raise these issues because I suggest that collectors who spend large sums on such coins are logically and ethically (though not legally) entitled to an explanation regarding methods of authentication. 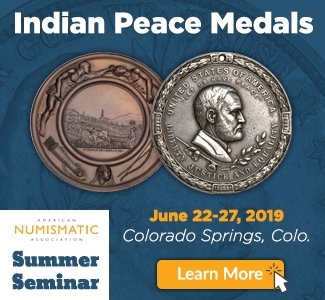 Besides, even if these four are all genuine and they might very well be, it is certain that there are people in Asia and in Eastern Europe who are producing forgeries of rare coins. There needs to be additional open discussion of methods employed to make fakes and of methods employed to authenticate coins. dollar series a few years ago.